Karma is the Law of Cause and Effect as applied to the life of the soul. It is the law whereby it reaps the results of its own sowing, or suffers the reaction from its own action. To the majority of reincarnationists it has a larger meaning, and is used in the sense of the law of justice, operating along the lines of personal experience, life, character, rewards and punishment. To the theosophists, the chasm between the “natural law” idea and that of the “moral law” with its rewards and punishments have been bridged and their theory places one foot on each conception. One leading view states that the Law of Karma is automatic in action and there is no possible escape from it. Absolute justice is manifested in its operations and the idea of mercy is absent from it. Every debt must be paid in full and there is no vicarious atonement or exceptions made in answer to supplications to a higher source. However, this law of action must not be confused with ordinary reward and punishment for good deed or bad deed but that the law acts just as any other law of nature. The scientific man would say that whatever was good had helped evolution and whatever hindered evolution was evil. There is another widely accepted view of karma held by Western thinkers who received it from the Greek mystics and occultists who in turned received it from ancient Egypt. This view aligns well with regression therapists who practices past life therapy. 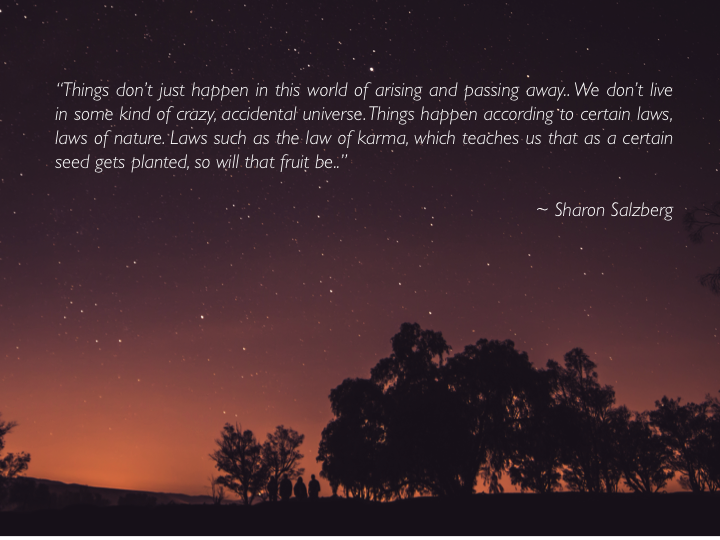 According to this view, the Law of Karma has nothing to do with Man’s theory of ethics or religious dogmas but has, at the basis of its operations, only universal and cosmic principles of action. These universal principles of action have to do with the evolution of all things in Nature. The evolving soul is continually striving to find the path along the lines of evolution, being urged to by the unfolding spirit within it. That path is always along the lines of least spiritual friction, and therefore proceeds along the lines of the least spiritual pain. Accordingly, spiritual pain is an indication to the evolving individual that he is on the wrong path, and that he must find a better way onward. The individual will heed the message by reason of the pain, and accordingly seek out for himself a better way - one that will bring less spiritual pain and greater spiritual satisfaction. This teaching holds that all material things are a source of pain to the growing and evolving soul, which tends to urge him along the lines of the least spiritual friction. It may be that the soul does not recognize the direction of the urge at some stage, and insists in tasting this material pleasure only to find that there was no satisfaction. The consequence is that the tired and wearied soul, when rested and reborn, has a horror and distaste for the things which disgusted it in its previous life. If the soul has not been satisfied, it wishes to go on further in its dream of material pleasure, and so it does until it learns its lesson. Finally, perceiving the folly and worthlessness of materialism, it breaks free from its cocoon and spreading out its wings takes its flight for higher planes of action and being. Under this view people are not punished “for” their sins, but “by” them. Sin is seen to be merely a mistake, not a crime. Pain arises not as a punishment for something done wrongly, but as a warning sign of “hands off”. Consequently pain is something by which we may mount to higher things and better things. This idea does not take the view that one suffers physical pain as a punishment for some moral offense committed on another plane. On the contrary, it holds that from the physical pain one may develop higher spiritual states by reason of a better understanding of the nature of the pain in oneself and others. This idea does not recognize material pleasures as a profit for spiritual or moral actions. It sees in everything as part of the working out of a great Cosmic Plan whereby everything rises from lower to higher levels. In this view, the idea that “the Universe is governed by law” is an axiom. Ultimate justice is also axiomatic but it does not see it in the operation of penalties and reward. Rather it finds it in the conception that everything is justified and just because the end is Absolute Good. Everything working of the great cosmic machinery is turning in the right direction of the Absolute Good. The way to live according to the Higher Light and without the fear of malevolent karma is to feel one’s relationship with the universal good and then to live one day at a time, doing the best that he knows how and be kind. Death is but a phase of Life, and above all, there is nothing to be afraid of. All is well with God and with the Universe. Henry M Tichenor. The Theory of Reincarnation Explained. Praxis international Inc. Pennsylvania, 2003. William Walker Atkinson. Reincarnation and the Law of Karma: A Study of the Old-New World-Doctrine of Rebirth and Spiritual Cause and Effect. YOGeBooks by Roger L. Cole. 2010.